The latest stage in my quest to interview a range of chefs and food business people across South Wales took me a couple of weeks ago to the recently opened La Galleria restaurant on Cowbridge Road East in Cardiff. I met Restaurant Manager, Karl Stickler, and Head Chef, Pietro Godino, and chatted to them about how La Galleria came about, their plans for the future, Italian food the way it should be – and cooking for Pavarotti! So, La Galleria opened fairly recently? Karl – Yes, we’ve been open for about three weeks now. We worked on it for about three months, real hard graft. How did it come about? Have you both been involved from the start? Karl – Yes, we’ve both been involved from the very beginning. We both used to work for the group that runs Bellini’s and Signor Valentino, and we’ve both worked in Italian restaurants for a long time. We got approached by the owner of the building – it used to be an Indian, and he wanted to change it over and start doing Italian restaurants, and he approached us two. Me because I’d done a set up before, Pietro because he was such a good chef, so that’s where it all started from. Why does the owner particularly want to do Italian here? There’s a couple of other Italians very nearby. Karl – He wanted to do it because of that – there’s La Lupa and Bar Sicilia as well, a nice little café. He’d seen that they’re always busy and there’s enough to go around. We want to be a bit different, a little bit classy – as you can see you might expect to find this place in town, and we’re only 6 or 7 minutes from town anyway, so it’s not completely out of the way. There are a few good restaurants in this area now. I was speaking to the owner of the Purple Poppadom, and he’s doing really well. Already we’re building a reputation, even in a few weeks of being open, it’s blown me away. Last night, even for a Tuesday night, it was really busy. You’ve got the Lounge Bar concept going on – have people been coming in and just using the bar? I can tell you’re really excited about it! Karl – Oh yes! We’ve both been working really hard – Pietro on the food side, myself on the set up and the marketing. I’ve been out promoting it myself on my breaks! I’m very ambitious. The response I’m getting off people is just overwhelming. I should be used to it really, I’ve been doing the job for long enough, but when you work for bigger companies, it just seems to be part and parcel of it that people go there. With this, people might be a little bit nervous – it’s a new place, it’s another Italian…but they’re not. They’re coming in, and they’re being surprised! Pietro, you’re Italian. When did you come to the UK, and what’s your background? Where did you learn to cook? Pietro – I first worked for (local restaurateur) Giovanni 20 years ago. I never actually cooked in restaurants in Italy, but I understand the food – I learnt from my Mum, in the house! I never learnt the trade professionally, but the way it’s cooked is how it should be. Karl – That’s why we say Italian food the way it should be, because when Pietro cooks it, he knows, it’s the way that it’s meant to be. He knows the flavours and what works, just by tasting it. Pietro – I first came to Cardiff on holiday but I ended up working for Gio! I stayed one year, and then I came back again! This time around, I came four years ago, and again I didn’t come to work in a restaurant, but here I am! 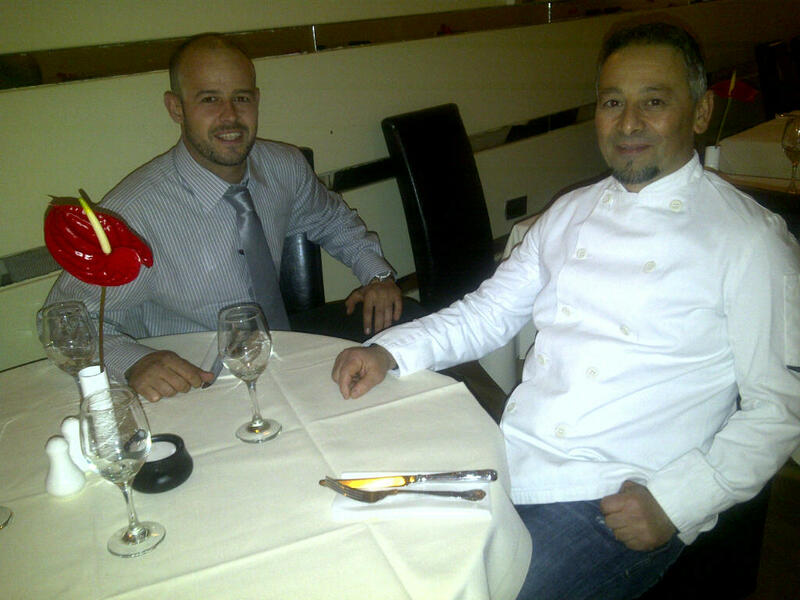 Karl – Giovanni owned the only big Italian restaurants in Cardiff, like Topogigio. I was a little boy then – but I remember Cardiff as dark and dingy in those days. Now it’s a big city! I’ve worked with some of the best Italian chefs, but Pietro’s just as good, if not better, just from learning from his Mum. It’s unbelievable! I’ve eaten at Pietro’s house, when we were colleagues at Bellini’s, and now we can do that food for ourselves here! We’ve started our menu with a mixture. We use stuff that other people don’t – the Boccatini – not a lot of people use that, and we use Linguini as well. We use those with some traditional sauces, but I’ve got a plan that in 6 months we’re going to work our menu up, develop it some more. We’re doing a lunch special now with arancini, funghi amaretti, pollo Bolognese, things you don’t really see on menus, but we love it. It’s proper Italian food – arancini, I could eat it all day! You find them in the little delis, and in Bar Sicilia, but you don’t often go to a restaurant and see them on the menu really. We’re going to see how it goes on the lunch, and then put it on to the menu. The pizzas we’ve done differently from everyone else, we’ve made them ourselves, they’re different, but the way that we do it is the way it’s supposed to be done. The way Pietro does it is amazing – I’m blown away! What’s your personal favourite dish on the menu? Pietro – When I’m hungry, I don’t follow the menu, I just cook the pasta or pizza that I feel like at the time! Karl – I love the Boccatini Amatriciana. That’s because he uses the Boccatini. I love Amatriciana sauce, but when we were at Bellini’s, I loved the sauce, but with Penne, there was something missing. When he does it with the Boccatini, which is like spaghetti but with tubes, it’s great. Pietro – It’s the right pasta for the Amatriciana or the Carbonara. It’s definitely about getting the right pasta to go with the sauce. Karl – I also love the Pizza Capriciosa, and the Foccacia La Galleria, which is spinach with Italian sausage and that’s really good – Pietro’s own invention! Karl – I see us being just as busy as the other Italian restaurants around here. I firmly believe we will be, given the response we’re getting now. We have further ambitions of opening up on the other side of Cardiff – we don’t know yet, it’s one step at a time, but already from being open for three weeks people are talking about us, and I want to be one of the best restaurants in Cardiff. That’s my aspiration. (At this point I – rather selfishly! – suggested that La Galleria should come to Penarth to open up their next branch, as I think we need a really good Italian here, and we discussed some of the other restaurants in the area). Karl – That’s one thing I don’t mind, talking about other people’s restaurants! My favourite Italian is Casanova – I know the chef there! He got to the semi final of the F word! I like Valentino’s too – I ate there for the first time recently and it was very good. I notice this from being on Twitter – restaurants are very supportive of each other. It’s almost like a community! Karl – In our trade there are a lot of people who know each other. We used to have a Sunday night where everyone would go to the same bar and you’d see all the people from all the Italian restaurants! There definitely is that community. A bit of a light hearted question now –which celebrity guests would you most like to serve in here? Karl – We’ve already had two celebrities in – Charlotte Church was in last Saturday, and Sam Warburton. Who would I like to see? This would be a more personal thing, but David Beckham, he’s my hero! It doesn’t matter to us, though, if it’s a celebrity or whoever, we’ll welcome everyone! I’ve met quite a few celebrities through working in restaurants over the years – Michael Jordan, Joe Calzaghe, Sir Anthony Hopkins – he came in to one place with his cousin who is from Cardiff. I’ve never been fazed by it, though. Pietro – I cooked for Pavarotti! Many years ago, I cooked for the Juventus football team and Pavarotti was there. Karl – That’s better than any of mine! You’re on Twitter and Facebook. How do you think Social Media will help in marketing the restaurant? Karl – Massively! Obviously I’ve opened new places before. When I did the last one, you had Facebook, but it wasn’t that big. This is the first time it’s been available to this extent. The quicker you are off the mark with it the better. We did it before we opened – we were very careful with how we managed it because you don’t want to be saying you’ve got a restaurant when it’s not even open, but we did it just about right, there were only a couple of people who knew about it, but a couple of days before we opened the response was brilliant. Social media is pretty much a free way of advertising. People can see the food with their own eyes – people eat with their eyes! They see the meals, and you can use it to do competitions and make people more aware. We’ve been doing it three weeks and we’ve got 1000 followers on Twitter. What do you think about food bloggers? Karl – I’ve got plenty of time for them. They make our job interesting! I’ve been used to working with mystery customers from a very young age, so I teach my staff now to always work to that standard, no matter what – if you’re ill, whatever kind of pressures you’re under, you should always give great service. Just be genuine, be nice to people and give them what they want. So, with regards to food bloggers I always work to the same standard when they come in. Hopefully that way they see what we’re about and they’re going to write good stuff about us. Have you had any negative publicity or feedback yet? Karl – Has there been anything that’s made me doubt what I’m doing? Never! Everything I’ve ever done, I’ve been confident with, and that’s why Pietro’s with me. I don’t think I could have picked another chef that I’ve had the same confidence in. With the team I’m building, the heart of any restaurant team is the chef, and I’ve got the perfect chef here. I like cooking as well – Pietro’s off tonight so I’m cooking, and I believe that when you’re a manager you should know every aspect of the job. Once we’re done here, I’ll be getting my whites on and heading into the kitchen! With thanks to La Galleria, Karl and Pietro for taking the time to speak to me. I’m looking forward to a return visit to sample their delicious-sounding menu!